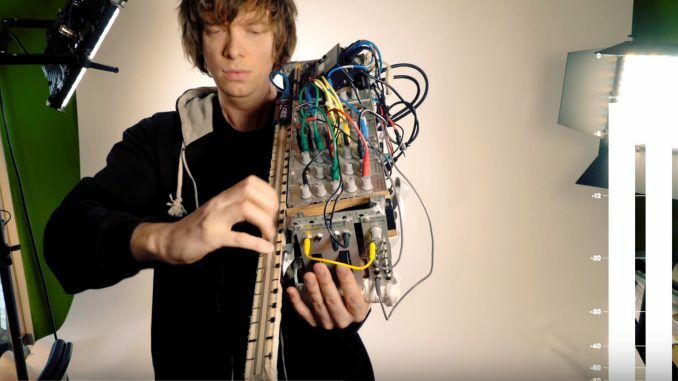 Wintergatan (Swedish music project) got Viral when they built the Marble machine…Here´s their (His?) next invention: The Modulin! Wintergatan (Swedish pronunciation: [²vɪntɛrˌɡɑːtan], The Milky Way) is a Swedish folktronica band from Göteborg. Martin Molin and Marcus Sjöberg were previously part of the former band Detektivbyrån. Between December 2014 and March 2016, the band uploaded several YouTube videos featuring Martin Molin documenting the construction of a music box that uses marbles to play instruments. The machine is powered by hand, and works by raising steel marbles through the machine into multiple feeder tubes, where they are then released from height via programmable release gates, falling and striking an instrument below. All the instruments are played by striking them and include a vibraphone, bass guitar, cymbal, and emulated kick drum, high hat and snare drum sounds using contact microphones. The music score is stored on two programmable wheels that utilise Lego Technic beams and stud connectors to trigger armatures to release the marbles. A final music video showing the machine in use was released in 2016. The video counts more than 35 million views on YouTube as of 7 February 2017.